3 bedrooms, 2 bathrooms, living room, dining room, family room, kitchen, patio, fenced back yard. MW, DW, W/D, 2 Cable TVs, WiFi/DSL, Gas Grill, POOL PRIVILEGES @ DAYS INN. No Pets During Summer, NO SMOKING. BEDS: 1 King, 1 Queen, 2 Single. Accommodates 6. I have always considered Jekyll my happy place. Th is week the weather was a little unusual, being cooler than normal, but by Tues. afternoon the sun returned. Had 3 adults, 2 teens and one 10 year old. Plenty of room and well stocked. 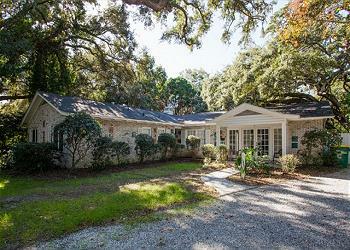 Nice backyard with a beautiful live oak. Stocked with plenty of books so you don't need to bring any from home. Close enough to walk easily to the beach. As an annual user of your services , we enjoyed your services. We had one problem with the property. The front bathroom commode had to be watched to be certain water cut off . This was our 2nd visit to Pelican House and it did not disappoint. It is a perfect vacation getaway and was everything we could have possibly wanted or needed. Fenced in yard was great for our dogs and fantastic location. Unfortunately we chose to leave early because of Hurricane Michael. We found out things were fine in JKL but we probably had issues trying to get home on Saturday. This was our 2nd stay at Pelican House. Love the house and location. Close to the beach and nearby restaurants. Fenced yard great for dogs but you still need to use leash due to holes in fence. Would be perfect if owners would just replace it. That being said, we will rent again! The Pelican House was the perfect vacation home with plenty of space for guests. We had an amazing vacation at Jekyll island and having this home through out the stay was a major part of it. We were able to see baby sea turtles in close proximity on the beach and deer are everywhere. The back yard was amazing but the only thing I did not like was that there was poison ivy around the walk way and the grill. I’m highly allergic to it and so was another guest. Luckily, we know what it looks like and avoided it as much as possible. House was in a great location. Big back yard. Loved the doors and windows. King size bed mattress needs replaced-not comfortable at all. Very quite neighborhood. Dolphin Tour is very good. Loved the shrimp basket at Love Shack in Jekyll Market- lots of shrimp at a good price. Good hamburger at the deli real meat. This perfect home has an awesome layout that is great for families or groups traveling together. The walk to the beach is short and only a few steps down to the sand. The fenced large backyard was perfect for the kids and the dogs to play without worry. We couldn’t have been happier. We highly recommend this house and Jekyll Realty. We had a wonderful week on Jekyll at the Pelican House. The house was perfect. It was much larger than we need so we only used the back part of the house. Never used the huge living and dining room. The yard was perfect for our dogs. It was clean with a large kitchen with everything we needed to prepare meals. Beds were comfortable. Tvs were great with recording capabilities. Great home,except for a few flaws . The bed in the master needs replacement of the masters mattress an box springs. The gas grill choice be replaced. Other than these problems the house is unique. We loved our stay in the Pelican House. The location was great and the house furnishings were very comfortable. The only negative thing was the house smelled like mold when we came in. We bought lysole and sprayed and it helped. The outside shrubs and trees needs some tlc and lots of growth around the house (glad I did not bring my dog because of the outside). We have stayed at the Pelican House twice. Beds are comfortable. Great backyard for the dog. Close proximity to the beach. We just love it! The space is great. We spent two weeks with our children and granddaughter. Loved the updated sink and countertops in the kitchen. Plenty of room to spread out in the house. This was the third time we stayed at Pelican House. Recommendations would be to fix the holes in the fence. We could not let our dog out due to the missing boards in the fence. We would have to go outside with her each time due to the fence falling down. Lots of flies in the house. Never seen this many before at this house. Backyard needs to be cleaned up and fixed. Trash was not picked up first week. My family and I go to Jekyll every summer. This is the second time we have stayed at the Pelican House. The house has great space and is within walking distance to the beach. Plenty of room for 6 to 8 people. The weather was unpleasant, but we enjoyed the house. We spent most of our time just relaxing which was the intent of our trip. Would like to do it again. The best visit we've had on Jekyll. We enjoyed our stay here withb4 adults and 2 small dogs to stay and spread out without being in each other's way. Very comfortable We were able to find everything we need and we enjoyed most of our meals at the house.The fenced in backyard was great for when we let the dogs out and for keeping our bicycles. We loved that we were able to ride out on bikes from the house or have a short walk to the beach. This was our first stay at Pelican house. It is located on a quiet street which is within walking distance to the beach. The house has large rooms with plenty of space which was great for my family and our two dogs. The kitchen is fully stocked with all the necessities. The bedrooms are large and have plenty of storage. I especially enjoyed the fenced in backyard for my dogs, which is why I chose this property. My only complaint is the fence has several holes in it which the dogs can escape, so we still had to use their leashes when outside. We thoroughly enjoyed our visit and will definitely return next year. All of your staff was excellent! Stay in this house and see all the paintings. We loved this house. Loved the painting on the fence and the tiles on the house. All appliances work, the beds slept good. It is a good place to be able to go to the beach. i would stay here again. House was very clean and in a great location. Quiet street. Comfortable beds, which was a pleasant surprise. Would definitely rent this house again. The house was perfect for us in every way!! I rented this property primarily for the lovely private fenced backyard with a gorgeous live oak tree for my husband, myself, and our small dog. We spent many hours sitting under the covered patio enjoying the solitude. Only a short walk to the beach was a plus. The interior is lovely, roomy and well maintained. We will definitely stay there again! !